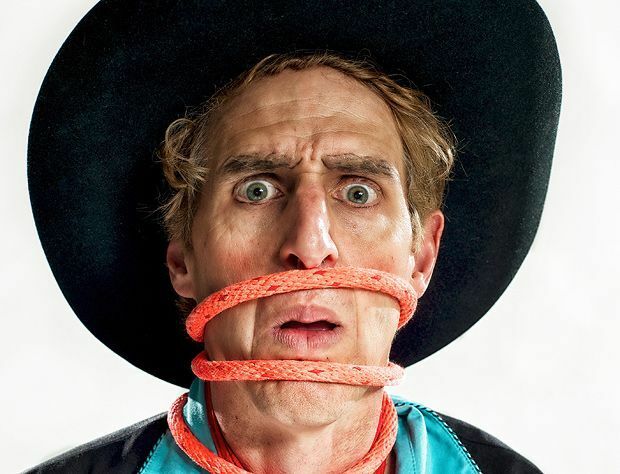 Taught by his grandmother how to ‘rope’ from the age of 11, Leapin’ Louie (aka David Lichtenstein) has spent years perfecting the art, turning it from a strategy to catch cows, to a refined circus act. Friendly and likeable, he isn’t quite rough and ready enough to be a true cowboy (surely that shade of turquoise wouldn’t work down on the ranch) but talks the talk as if he were the real deal. If, at times, it feels as though he’s slightly labouring the point about how hard it is to perform rope tricks, it’s only because he’s right – it is hard, and he deserves our respect. The comedy, such as it is, is gentle and fun rather than hilarious, but that’s OK, too – he has other talents. Watching him wield a lasso that becomes bigger and bigger, in such a small space, is truly impressive. As is the trick where an audience member circles a toy plane above her head, trailing a line of toilet paper which Louie slices up with precise cracks of his bullwhip. Louie’s playful but considerate rapport with children feels safe and inclusive – he’s the kind of man you’d want at your child’s birthday. Which is pretty much how this show comes across – like a high end, great-if-you-can-afford-it piece of children’s party entertainment. Happily – for the time being at least - in the increasingly diverse world of family theatre, there’s still room for this kind of fun. Pleasance Courtyard, 556 6550, until 31 Aug, 11.30am, £7--£8.50 (£5--£6.50).